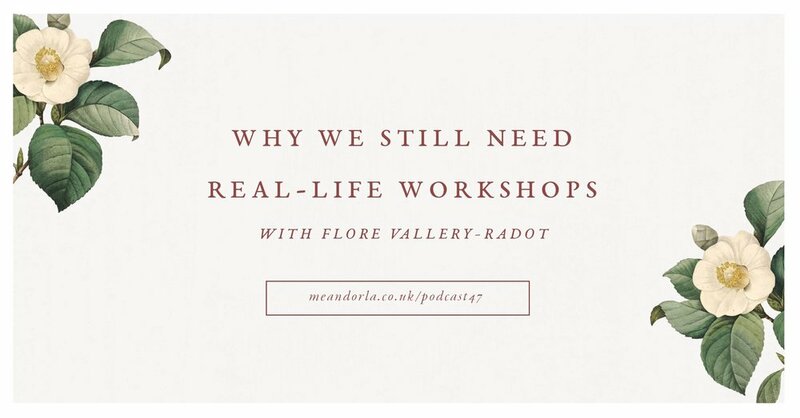 "Photographer and videographer Flore has had an eclectic journey through marketing and running an online textile store to the work she does now, and along the way one thing has been essential to her growth: workshops, with other creatives. This has left her with a burning passion to create these types of events herself, to help fellow floundering creatives connect, skill up and develop their ideas to make their big dreams come to fruition." 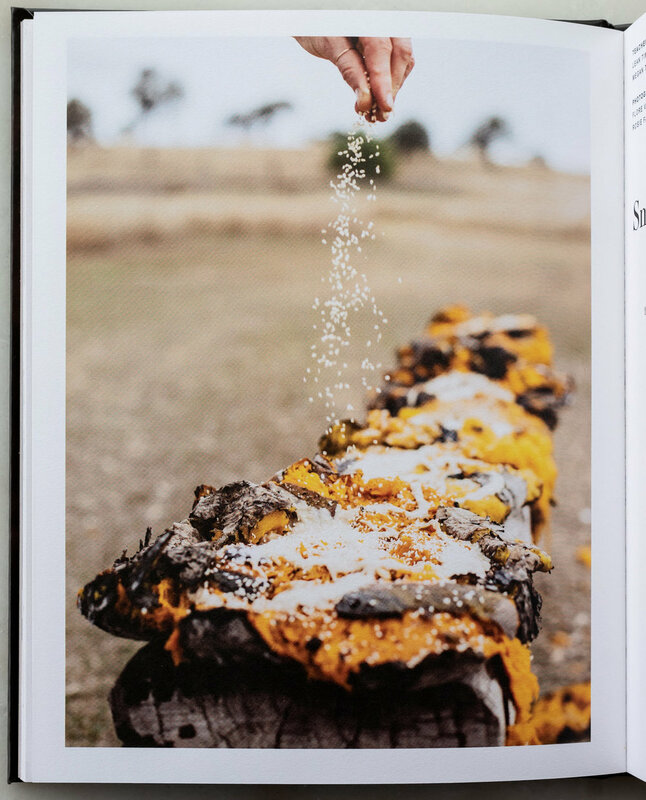 “We begin the series with a letter from Flore Vallery-Radot, or Flo, a French- Australian photographer, filmmaker, entrepreneur, workshop host, mother, wife, beekeeper and passionate cook. I asked Flo to tell me about the flavour of her home on the outskirts of Sydney, Australia. Flavour is a favourite word of mine. Yes, it describes the unique taste of food or drink, but it also captures the character of something… the mood of an event, the tone a conversation, the feel of a home. Flo’s answer, with her beguiling voice, takes us on a magical exploration into travels, relationships, flavour memories, culinary adventures, heartaches, love stories and cookbooks, so many cookbooks. Just beside the wall of cookbooks in Flo’s house is this ‘tea pot’ corner. I took this picture when I visited her home last May, as Flo cooked lunch for us. The corner, studded with teapots, reminded me of Alice in Wonderland – familiar yet whimsical. This is Flo. Her instagram account reads, ‘I create evocative little films for you’… but her whole life is evocative, from the white curtains billowing through the glass door, pushed by a gentle breeze and the jazz coming from the speakers… her colourful dress swirling as she danced around her kitchen…the magical lunch of French delicacies enhanced with Australian ingredients… the much-loved cat, purring on the sofa. 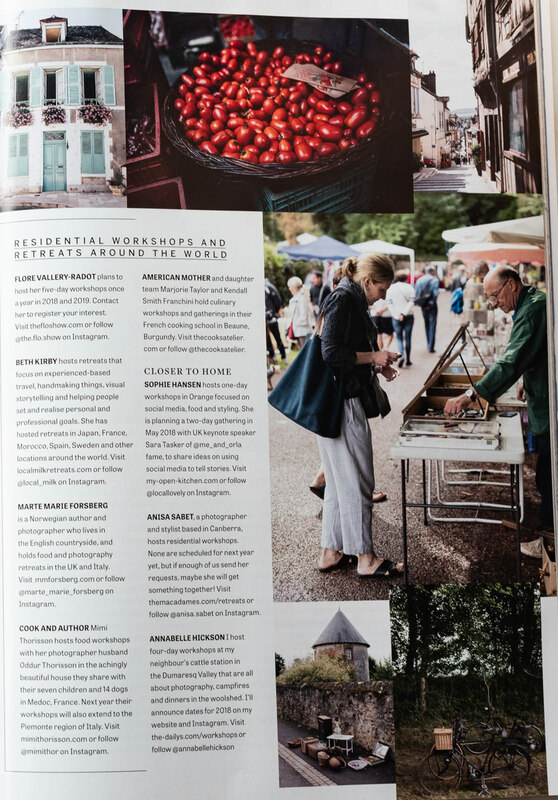 Country Style Magazine Australia has published photos I took in Burgundy to illustrate an article by Annabelle Hickson about the great trend of Workshops. In 2016, I took part of this cookbook project orchestrated by food photographer Luisa Brimble and photographer, author and stylist Annabelle Hickson. The result is a wonderful book, full of declicious recipes by Wild Cook and cookbook author Sarah Glover. I’m very proud of my photos of yabbies and smashed pumpkins! TV host and food adventurer Maeve O'Meara explores the beauty of cooking with ingredients from the earth's elements. She asked the people she interviewed and filmed for Food Safari to share a few recipe. It’s absolute gold. I only have two photos of Restauranteur-farmer Palisa Anderson in the book and it’s such a pleasure to be part of this fabulous project.